First Vietnamese-American Catholic bishop, dead at 77, helped connect refugees to U.S.
Dominic Luong served as auxiliary bishop for 12 years in California’s Roman Catholic Diocese of Orange, home to an estimated 70,000 Vietnamese Catholics. IRVINE, Calif. — Dominic Dinh Mai Luong, the first-ever Vietnamese-American bishop, who spent his career advocating for refugees and immigrants, died on Dec. 6 at the age of 77. 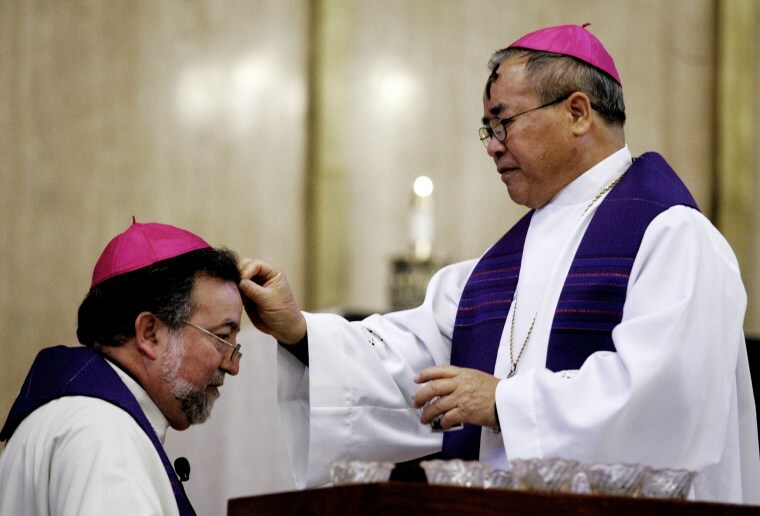 Luong served as auxiliary bishop for 12 years in Southern California’s Roman Catholic Diocese of Orange, which is home to an estimated 70,000 Vietnamese Catholics, the largest such community in the United States, according to the Diocese. To represent his ministry to migrants, Luong had chosen the Bible verse “You are strangers and aliens no longer” (Ephesians 2:19) as the official motto for his coat of arms. Luong was born in 1940 in North Vietnam, about 50 miles outside Hanoi, according to the Diocese. It was there that he entered the seminary, but at age 16 he was sent to the United States to finish training for the priesthood. He was ordained a priest in 1966 in New York, but was unable to return to his home diocese because of the Vietnam War. After the 1975 Fall of Saigon and the arrival of hundreds of thousands of Vietnamese refugees into the United States, Luong was recruited by the Archdiocese of New Orleans, where he served as director of the Archdiocesan Vietnamese Apostolate. Tran added that Luong became a sort of lifeline for new Vietnamese arrivals in New Orleans at a time when most of them weren’t yet fluent in English. He spoke on behalf of the community to local civic leaders and even took personal calls from those who needed help with day-to-day tasks like going to court or negotiating workplace disputes. Luong also became the founding pastor of Mary, Queen of Vietnam Parish in New Orleans, which Tran said was the first Vietnamese-language church in the city. In 2003, Luong was appointed Auxiliary Bishop of Orange, becoming the first Vietnamese-American bishop in U.S. history. In addition, he served as a leader on the national level, as director of the National Center for the Vietnamese Apostolate and as director of pastoral care for migrants and refugees for the U.S. Conference of Bishops. Tran said that Luong’s old congregation was “proud” of his elevation to bishop. Nguyen said that the Diocese of Orange’s Vietnamese Catholic community felt the same. During his time with the Diocese, Luong advocated for immigrants, including joining other Catholic clergy across California in launching a comprehensive initiative to naturalize legal permanent residents eligible for citizenship across the state. Luong retired in 2016. In October, the Vatican appointed Thanh Thai Nguyen auxiliary bishop for the Diocese of Orange. Nguyen is slated to become the second Vietnamese-American bishop in U.S. history after his scheduled ordination on Dec. 19. Tuyen Nguyen, the Westminster pastor, said that one of Luong’s dreams during his tenure as bishop was the construction of a shrine to Our Lady of La Vang, a Vietnamese Marian apparition that has also become a symbol of persecuted Catholics in Vietnam — a subject Luong was writing a book about at the time of his death. As a result of Luong’s initiative, the Diocese announced last December that it would embark on a $25 million project to build a plaza and shrine to Our Lady of La Vang at Christ Cathedral in Garden Grove, the spiritual and administrative center of the Diocese. The site of the shrine, which Nguyen hopes will become an international pilgrimage destination, was blessed on Oct. 21, and is expected to be completed in 2019.